Greg LeMond, the USA’s only Tour de France winner, has launched a new venture called LeMond Inc, the initial product being the already established Lemond Revolution indoor trainer. LeMond has been in the news lately because he is currently recovering following a collision in his car. And, of course, he has been mentioned frequently in the unfolding Lance Armstrong scandal over recent weeks, the three-time Tour winner having voiced doubts about the legitimacy of Armstrong’s race achievements over many years, leading to a very public, very heated battle of words. 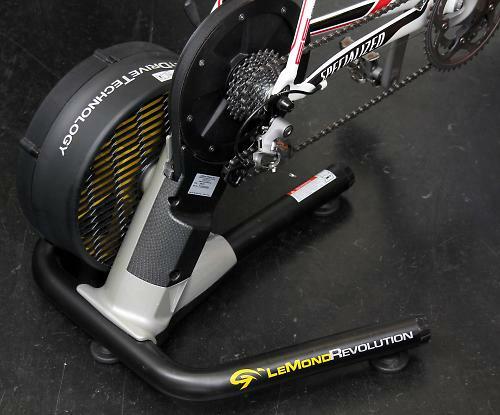 LeMond Inc has acquired manufacturing and distribution rights to the Revolution trainer, previously owned by LeMond Fitness. Hoist Fitness has bought the rights to the LeMond electronic exercise bikes and indoor bikes. These will be rebranded as “LeMond, Powered by Hoist”. The Revolution trainer has been around for the past three years and we’ve reviewed one on road.cc. The big innovation is that rather than running your rear tyre against a resistance unit, you drop out your back wheel and use a cassette fitted to the trainer itself. LeMond Inc plans to launch other products in the near future, starting with a line of Revolution-compatible accessories. “For the last 30 years I have been passionate about design and technology,” said Greg LeMond, who won the Tour in 1986, 1989 and 1990 “This new company gives me the opportunity to dream again. The Revolution trainer will serve as our foundation. LeMond Inc has not said whether or not it plans to get involved in full bike production in the future; there are no indications to suggest it will although Greg LeMond reportedly obtained control over the LeMond Bicycles name in 2010, the bikes having previously been made by Trek. The two parties reached an out-of-court settlement over LeMond brand issues, although the terms have not been officially disclosed.